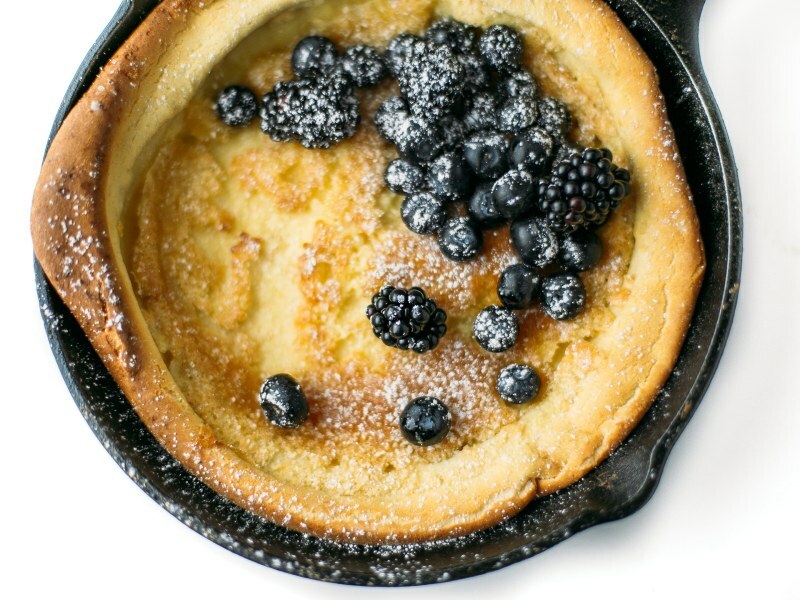 If you've never tried oven-baked pancakes, use this recipe for a new spin on everyone's favorite sweet breakfast. 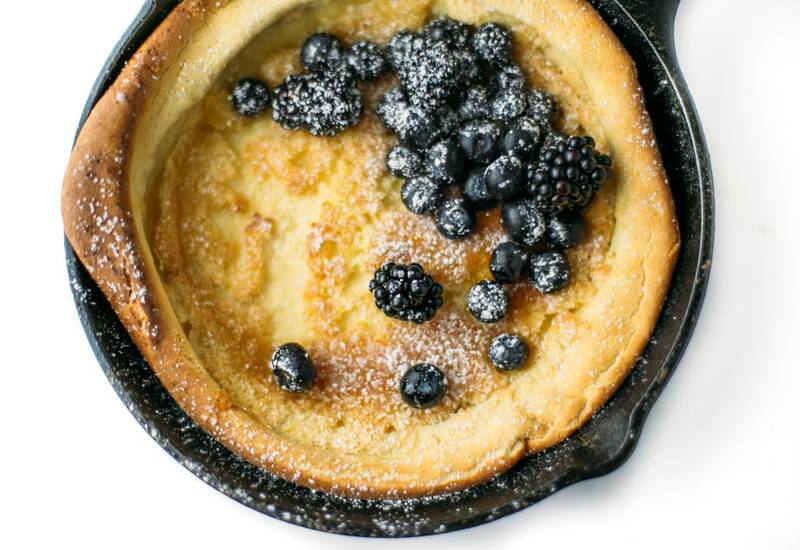 And it couldn't be simpler: unlike traditional pancakes that require standing over the stove forever, the ingredients in this recipe get a quick blitz in the blender and are then poured into a butter-coated cast iron skillet. 20 minutes later, you've got a puffy, light and tender pancake that's ideal for an impromptu brunch party, easy breakfast or even dessert. Serve with your favorite fruit and lightly whipped cream for a decadent way to start the day. 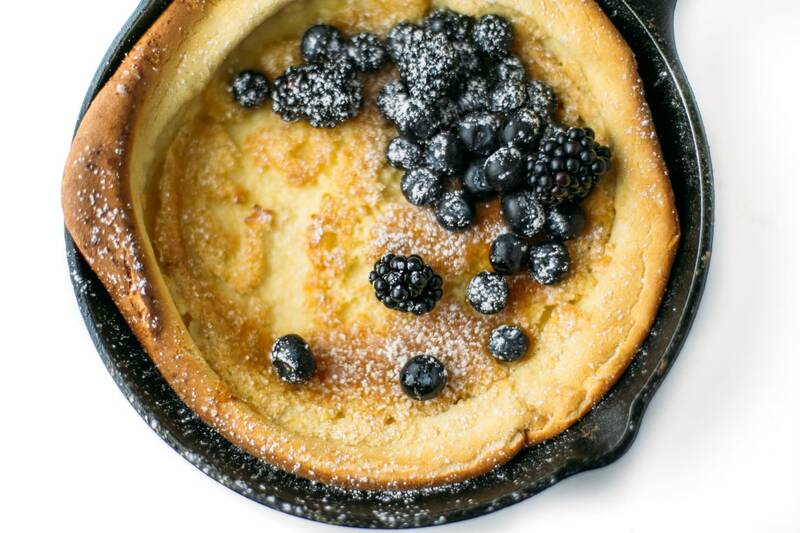 Drizzle the Dutch baby with maple syrup, or sprinkle confectioners' sugar over the pancake and then squeeze fresh lemon juice over it for a new favorite. We love serving with mixed berries, sliced peaches or lightly sautéed apple slices sprinkled with cinnamon. Per Serving: 277 calories; 16g fat; 23.5g carbohydrates; 7g protein; 173mg cholesterol; 201mg sodium. Dutch babies remind me of my childhood, but I haven't cooked one in years. I tried this recipe and it worked out beautifully! Heating the pan with the butter in the oven before you pour in the batter is super important here - its what makes the cake rise and bubble in the pan. I topped mine with powdered sugar too, the way my mom always did. Delicious treat! This is probably one of the easiest recipes ever. Everything goes into a blender, then baked. Watching it rise was the fun part. However, once its done and out of the oven, it will start to (deflate)very quickly, so serve almost immediately with powdered sugar and fresh fruit. My personal favorites are adding blackberries or lingonberry sauce. So easy to make and tons of flavor (with the right toppings). I used syrup and brown sugar on half and jelly on the other half. Very sweet and delicious! I can't wait to try this recipe! I have never made a dutch baby! I had decided a lower star when I was preparing this recipe because the recipe is a little confusing, then again I’m a little confused. I think I will read through the directions before I make it next time and there will be a next time!! This was soo delicious, it was a great breakfast but I will be using it for a quick dessert also. Also if company comes. Really great recipe, so simple and easy to follow. The Dutch baby tasted great, but I will say it was thinner than expected. A favorite topping of mine for Dutch babies is lemon and powder sugar. Overall it’s amazing and I will definitely make it again.